Aromatherapy is the practice of using essential oils and other complementary ingredients for psychological and physical well-being. The aroma of essential oils stimulates the brain to trigger a beneficial reaction. In addition, inhalation into the lungs can often supply a therapeutic benefit, such as easing congestion. Complementing the various forms of massage therapy, aromatherapy can alleviate sinus problems as well as migraines and muscular pain. 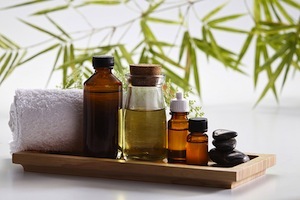 At Massage Meridians, many of our clients avail themselves of the multiple benefits of aromatherapy. To explore how aromatherapy may be beneficial to you, contact the professionals at Massage Meridians for a personal consultation.